"A ranger from the Kenya Wildlife Service walks past 15 tons of elephant tusks which were set on fire, during an anti-poaching ceremony at Nairobi National Park in Nairobi, Kenya Tuesday, March 3, 2015. 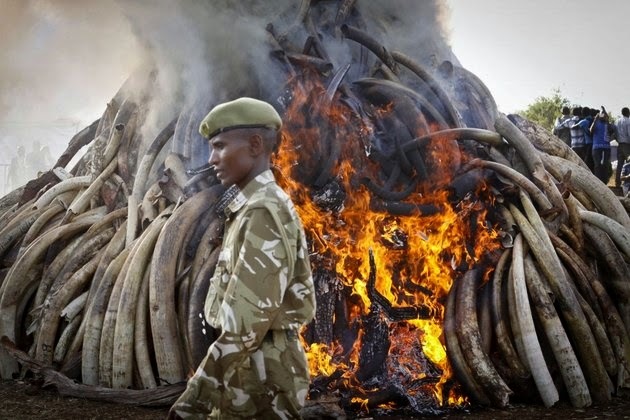 Kenyan President Uhuru Kenyatta set fire to the elephant ivory during World Wildlife Day to discourage poaching, saying that 25 years after the historic banning of the ivory trade, new demand from emerging markets is threatening Africa's elephants and rhinos." Photo credit Khalil Senosi, Associated Press, via the StarTribune. It is horrible, and barbaric, that animals on the edge of extinction should still be killed to indulge a superstitious belief by some people. There is no scientific evidence that elephant tusks are of any benefit to humans at all.... And I love elephants! I so agree. Rhinos look like something left over from the dinosaur era, and elephants are magnificent--and amazingly intelligent. I understand China, traditionally one of the largest purchasers of endangered animal products, has enacted laws against it, but some other countries, such as Viet Nam, are doing their best to take up the slack. So very sad and ignorant. China may have the laws on the books- but their enforcement is a joke. Both countries need to be held liable for their (in)actions. But doesn't the burning of 15 tons of ivory tusks, and the attendant publicity of the burning of them, in fact, communicate that there are less 15 tons of ivory tusks in the world, thereby driving down supply? And thus doesn't diminishing supply drive up costs and drive up demand -- and therefore make "poaching" more desirable? Is this another example of a "well-intended solution" -- like many (ahem) "liberal" solutions -- having the complete OPPOSITE effect of the one intended? Are genetic samples from the hoards of tusks held back for the future? A wealth of genetic information, otherwise burned and lost.